Focusing on rural India, Finance Minister Arun Jaitley in his Budget on February 1 announced a minimum support price 1.5 times the cost of production of crops. But there is more to the announcement than meets the eye. At present, the MSP for eligible crops is declared by the Commission for Agricultural Costs and Prices. The CACP has three different definitions of productions costs -- A2 (actual paid out cost), A2+FL (actual paid out cost plus the imputed value of family labour) and C2 (comprehensive cost including imputed rent and interest on owned land and capital). The difference between C2 and A2+FL can be substantial. So, the outcome of the finance minister's announcement of MSP at cost plus 50 per cent will depend on which of the three formulas is being factored in. 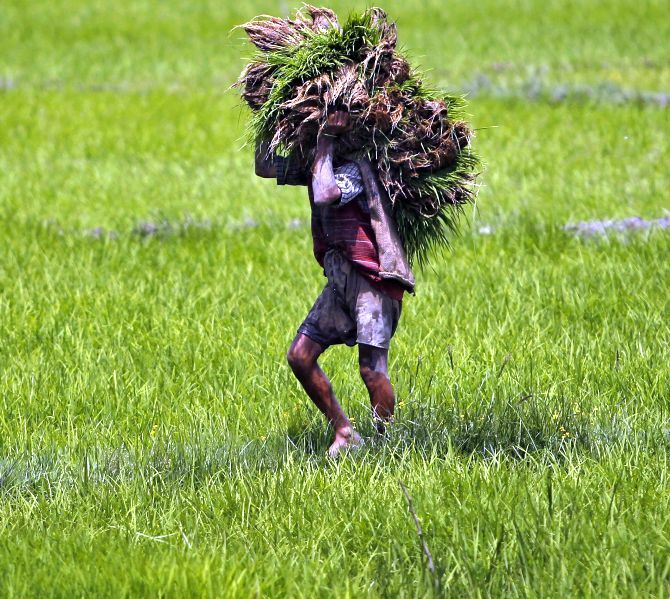 "TOP is a very commendable step," Ajay Vir Jakhar, chairman, Bharat Krishak Samaj, which was formed to advocate farmer prosperity, tells Rediff.com's Syed Firdaus Ashraf. In one of your tweets you mentioned that a farmer commits suicide every 45 minutes and that 36,000 farmers have committed suicide in the last three years. Do you think this Budget will solve that problem? The Budget alone cannot solve the problem of farmer suicides. This problem has been going on for a long time even before this government came to power. I am not getting into the political angle of it all by stating that the farmers are committing suicide because the government has done nothing about it. This issue is not under the domain of the central government alone, but state governments too. Farmer suicides also include state policies. The Budget is just allocation of funds, and agriculture is a state subject. And a lot of effort has to come from states also. The Budget is only a part of it. It is very clear that it is A2+FL. I think the minister of agriculture has said this and so has a member of the NITI Aayog. Will A2 + FL solve the problem? Or is the C2 formula the answer for farmers' problems, as stated in the M S Swaminathan Commission report? First, you have to define a problem. What is the problem? Minimum Support Price will not solve the problem as only 10 per cent of farm produce is procured under MSP. MSP is not the solution for the larger problem of Indian agriculture. As of now, I think only 23 crops are covered under MSP and of that 23 only three or four actually get (support price). So even if you announce higher MSP this does not solve anything. Don't you think the middle class will incur huge inflation if the A2+FL formula is implemented? Controlling inflation is very important, but if you use farmers to control inflation, then they need to be compensated somehow. If you get good price for farmers, then the middle class will get incited. So the government needs to find out the right combination of inflation targeting and incentivising farmers. Just as Operation Flood was a success in Gujarat, can Operation Green be successful in India by taking only three commodities -- onion, potato and tomato? These three commodities have been chosen very well and this proposal was lying with the Government of India for the last four years, after Dr Pravesh Sharma had suggested it. Now, it is up to the state governments and central government to see how it is implemented. The government has to actually do some hand-holding. Simply allocating funds is not enough and it is only half the job. The other half is to help them to organise and give them information on how to use government machinery. It is a very commendable step. Last month farmers in Punjab and Uttar Pradesh threw potatoes on the roads because of a slump in the market. Where did we fail farmers as a nation? Once we became food grain surplus, we became complacent over the farm issue. Till the 1980s, our country was always short of food but post the 1990s we always had enough food to go around. So as a country we felt that let us change our priorities by not paying attention to farmers and concentrating on other sectors. The farming sector actually went out of focus after that as the mindset shifted that farmers are no longer a priority. When farmers started successfully delivering food, they lost relevance to the nation as a whole. What happens in the developed world? I have never seen prices of food items going up in Western countries. Why is there a food price crisis here? Our crisis is not the inability to grow food, but it is man-made. Firstly, the West has a very small population that they need to feed. The West chose the Industrial Revolution early and they were able to successfully shift their agricultural population to the industrial sector. We missed the bus as we were ruled by the British. By the time the British left, we could not get out of agriculture. China managed to do that, but in India more and more people are still dependent on agriculture. Secondly, the West has only three per cent of its population dependent on agriculture and they can look after them by giving them subsidies. If the West also had 40 per cent of its population dependent on farming and they had to give subsidies, then they too would not have been able to do so. 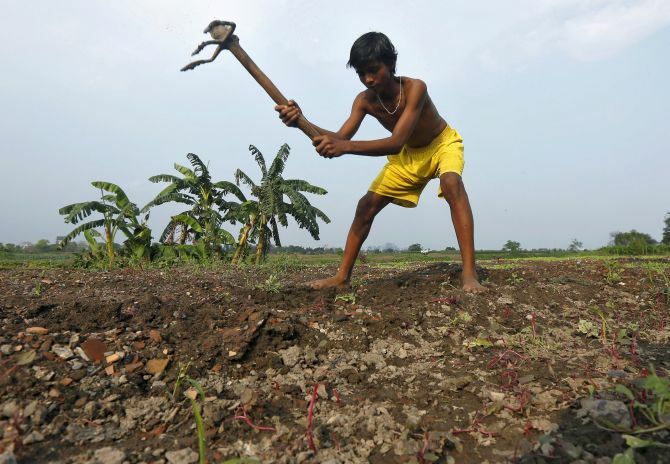 After the Green Revolution, why has there been no other agriculture revolution in India? We became very complacent after liberalisation. Look at the Chinese economy. They first focussed only on agriculture and did not focus on industrialisation. But when we went for liberalisation, we directly went after the financial markets and never bothered about the agriculture market. In our country we just rush into things rather than planning. Every year there is one vegetable or farm produce which is in shortfall. Sometimes it is potato, sometimes pulses or onions. It is not that in one year there are 3, 4 (food) items that are in shortfall. It has never happened in two decades. If the price of tomatoes rises, then don't eat tomatoes, but then people say there is no replacement for tomatoes or onions. The Jain community does not eat food with onions, do they? So it is all about choices that we make and how the government reacts to the urban population demand. Can the income of farmers double by 2022? Do you think it is possible as the Modi government has been saying? I don't think it is possible to double farmers' income by 2022. The definition of farmers' income is now A2+FL and they say this will double their income. So, the government has changed the cost of production's definition. It is a very generalised statement. Farmers' income varies from one state to another. The government should have said it will double the income in those states where their income is less than average. For example, there is a difference between the income of a farmer in Punjab vis a vis Chhattisgarh. How will Modi's TOP slogan help? The Budget has been allocated and now state governments have to organise all these things. Potatoes, tomatoes and onions are mass consumption crops. All these things can be stored. Having a programme like this is a good scheme.